It’s been an emotional year with many highs and lows along the way. We’ve worked all around the world from as far and wide as Sao Paulo, New York, Detroit, Amsterdam, Lausanne, Zurich, Hong Kong, Muscat, Abu Dhabi, Tallinn, Melbourne and Doncaster! And we’ve also had the privilege this year to be asked to help to reimagine and reinvent the worlds of transportation, hotels, security, finance, policing, ageing, interiors, odour, government policy, food, cities, healthcare and homelessness. In this introspective time of year I’ve been reflecting recently on how bringing more emotion into our work this year has really helped us to learn and to grow. But it’s also been tough to know how to handle many of the emotions a lot of the time, and there have been several difficult and heartfelt conversations along the way. Nevertheless I’ve been reminded again this year just how important it is to share, channel, and harness emotion in our lives and in our work, especially when confronting change, which ultimately is what innovation is all about. I recall that our first ever paying client 8 years ago was a large cancer charity. I was taken aback in one of our first workshops when very quickly several of the participants started crying as they shared their experiences of having lost loved ones to cancer. Yet it was also a privilege to create a space where people felt able and willing to share their stories and their emotions, and an amazing platform upon which to build new ideas. And I’ve been reminded again recently how one of the three biggest drivers of collective intelligence is social perceptiveness. In other words to ability to read the emotions of others accurately. I don’t know why it’s taken me so long to truely recognise this albeit I know gender certainly certainly is an important factor. Which is why one of the other three biggest drivers of collective intelligence is the number of women in a group. In working with UsCreates this year on a number of projects I was surprised to notice that they sometimes ask the question “How can we bring more emotion to this”? This was whilst we were coming up with challenge questions to tackle in a new project. It is a great question that unlocked much deeper and richer insight. 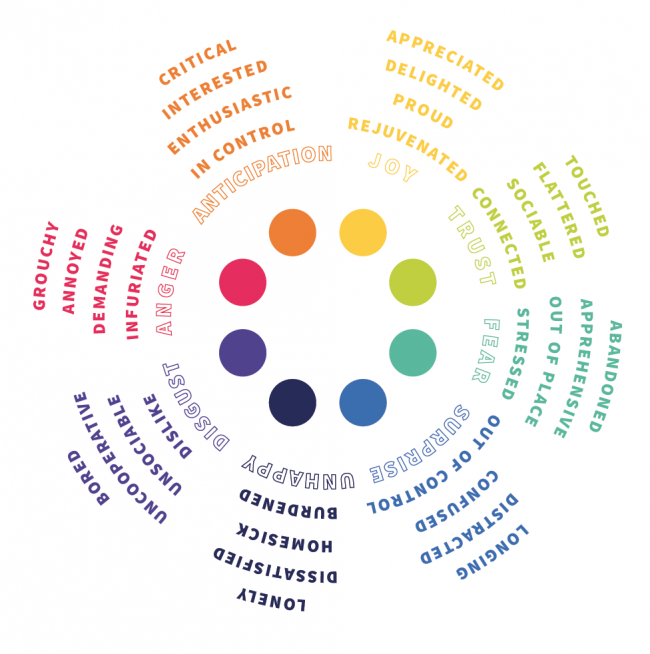 When I first met my business partner and 100%Open co-founder David Simoes-Brown he shared with me that he was writing a book to classify and categorise every single human emotion (which the emotion wheel above is a simplified version of which is part of our open innovation toolkit)! It’s been a while since we discussed it but I know that he and others believe that all emotions come in pairs. So to paraphrase Newton’s laws of motion “For ever emotion there is an equal and opposite emotion”. Well the two of us have kept each others emotions in balance this year more than once and I look forward to finally reading that book one day. In summary I felt rather burdened and distracted at the start of the year with my attention being pulled in many different directions. I now feel very proud of what we have achieved and anticipation for what lies ahead. And I hope to feel rejuvenated and more connected to people, places and ideas as we move into 2018. Wishing you a good break and an emotional and ever changing new year.